Happy National Interview Day! Express Employment Professionals is excited to celebrate this day with you, so come by and learn about the jobs available near you. To prepare, here are a few common questions from our job seekers that our recruiters have shared insight into in previous articles. I’ve been asked the following: “Tell me about your experiences, specifically, how do you attribute your successes?” What are good answers? “I think good answers are ones that are quantifiable! For example, an accounts receivable person could say that they were successful in their last role by cleaning up aging reports and collecting over $1 million in 2016.”—Shannon Jacoby, Bellingham, WA. Many companies use a college degree as a baseline. Sometimes a degree is indicative of passion and hard work. However, you might be able to make up for the lack of a degree in other ways. “Sometimes, this is a company policy. I tell people to never let it deter you in applying. Many clients will take on-the-job experience in lieu of a degree.”—Shannon Jacoby, Bellingham, WA. What behaviors are recruiters and hiring managers looking for in an interview? Although much of the interview focuses on testing your hard skills (your job experience and abilities), your soft skills are being tested as well. How do you handle stress? Do you make the proper amount of eye contact? How does your personality fit in with the company culture? Interviewers look at certain cues for insight on how you might function as an employee. Apply now to join your local Express Employment Professionals office for National Interview Day on Aug. 9, 2018. Applying online will expedite the interview process and allow us to schedule a time for you to interview. Express can help you find the type of job that fits for your needs and abilities, and you’ll never pay a fee for our services and support. Contact a local Express office or register online today! 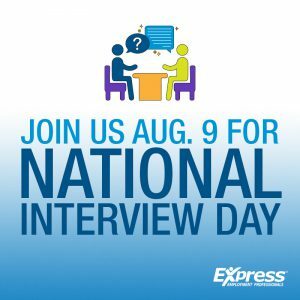 Click here for more information regarding National Interview Day at Express. Do you have any questions about National Interview Day? Let us know in the comments section below. Previous Post The 2018 Job Economy So Far: Will You Find a Job?